Lovely Things: Sending love & chocolate for . . .
Sending love & chocolate for . . . I have a few friends that throughout the year we surprise each other with little gifts. This time I'm sending them a box with a few things I'm loving right now. 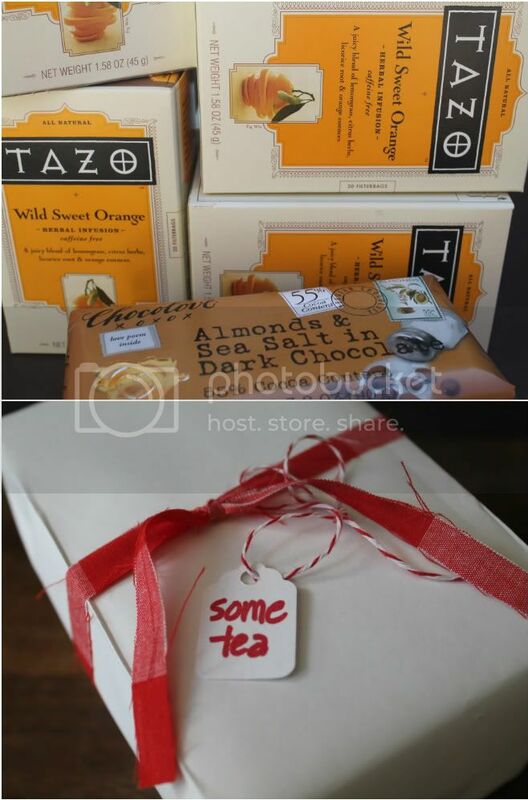 At Christmas, my sister included a box of Tazo Wild Sweet Orange Tea. It's the best tea I've had in a long time. The only place that I can find that has this exact flavor is Whole Foods. And they also happen to have this candy bar....almonds, sea salt and dark chocolate. I try to make the bar last the entire week...or sometimes I just eat the entire bar on my way home from the market...there are those days. Mix butter, sugar and vanilla until combined. Add flour and mix together. 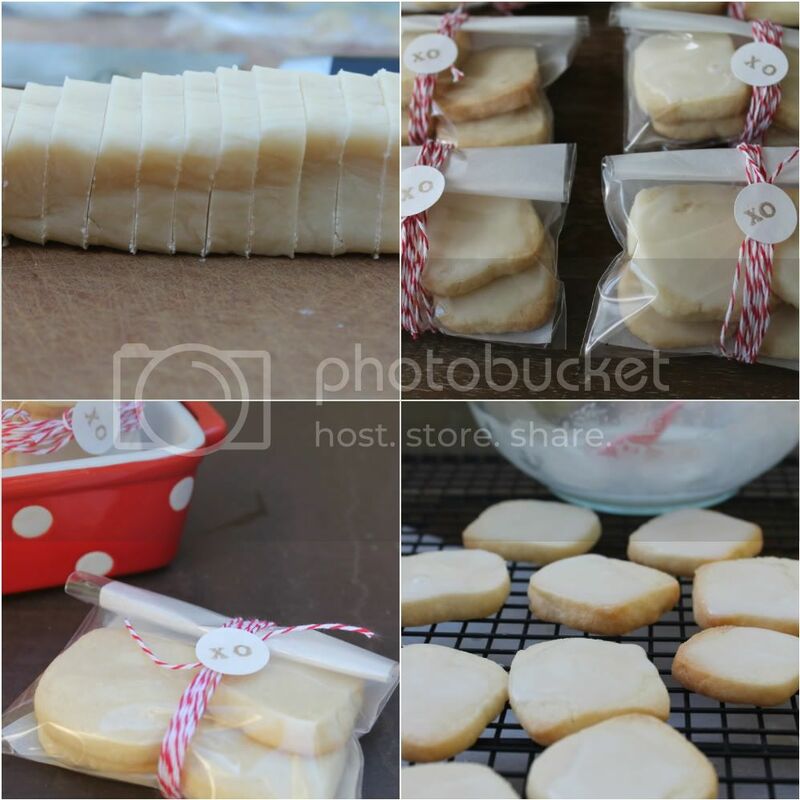 On plastic wrap, form dough into rectangles and square the edges. It makes 3 to 4 rectangle logs. Refrigerate for an hour or over night and slice while still cold about 1/4 inch thick and bake on a baking sheet lined with parchment paper for about 10 minutes in a 350º oven. For the glaze, add a scoop of confectioner's sugar and a little fresh lemon juice. Whisk together adding a little water if necessary until it is very thin. Spoon the glaze over the cookies on a cooling rack over parchment or wax paper to collect the glaze that runs off. 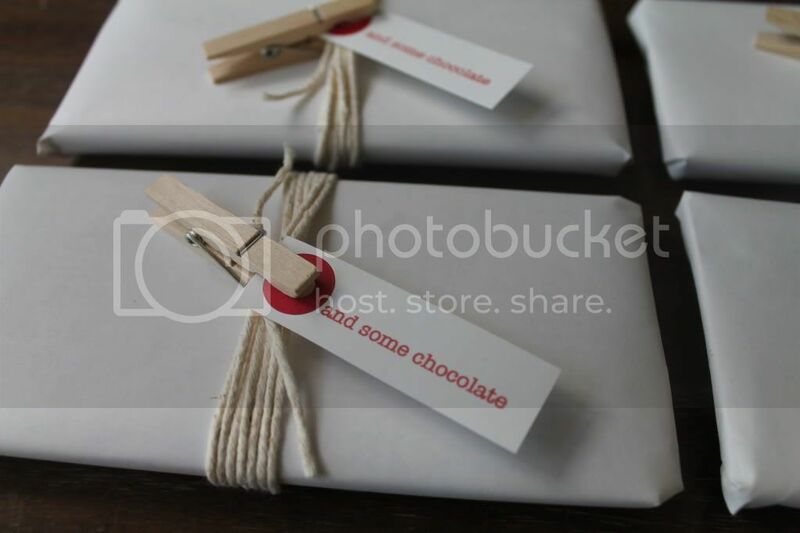 I wrapped the chocolate using white paper and twine and then made little tags on card stock. I used a red paper reinforcement and attached it to the knotted twine with a mini clothespin from the Advent Calendar project. Since we are moving in June...I am trying hard not to buy anything. I used supplies that I've had for years. I tied the boxes of tea with strips of red and white gingham fabric. Out and about in Laguna Beach this week we came across the most beautiful children's shop. The entire shop is wonderfully decorated and they had these little necklaces that had a few charms on a piece of red window pane fabric. I don't have children young enough for this shop, but it was worth a visit just to see how the owner displayed things, worked with the space to make it a very charming shop called Hillary. So thoughtful! Your friends will love receiving these lovely gifts! The tea sounds delicious. I have been on the lookout for a new tea to try. Thanks for sharing. Have a great weekend! 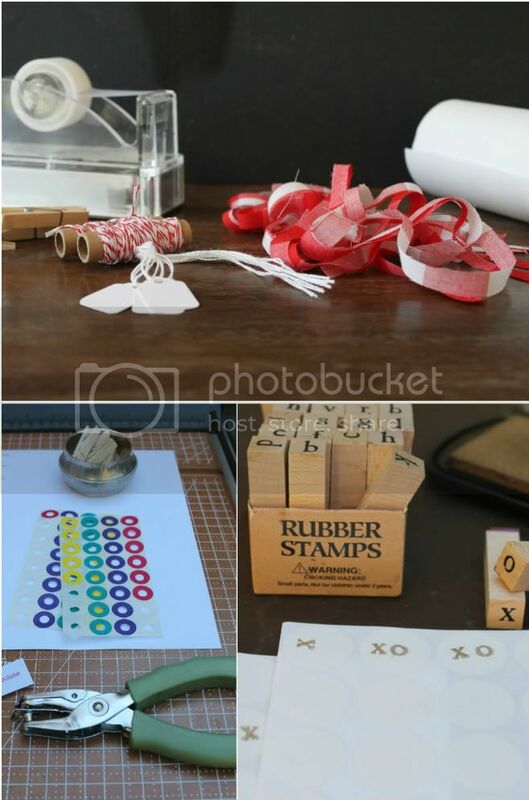 Pretty photos and ideas for Valentine's Day! Thank you for the cookie recipe! We adore shortbread at this house. Your gifts are so yummy and wrapped love~stylishly!
. I am going to Whole Foods tomorrow for one of those candy bars. All my favorites in one delightful bar. Yum! So many great things in this post. I'm heading out to find that tea, first of all. My favorite tea up till now has been Celestial Seasoning's Tangerine, but I can't find it anymore. This will be a great replacement. Your have lucky friends! Such a SWEET idea! Your presentation is perfection! I love using simple items to wrap gifts, especially office supplies. They last forever, they're cheap and can easily be transformed into something simply beautiful. I'm currently addicted to using kraft paper manila envelopes. I bought a box of 100 and I'm sure they'll last me quite a while. How pretty these gifts are ... my kind of wrapping! Your ideas are incredible! You have set my wheel's turning!!! What a thoughtful friend you are and the gift wrapping is lovely! What a lovely thing to do to show your friends you care. They are lucky to have you as a friend. WOW you are a sweet and thoughtful person. AND a great photographer. I want/need a new camera. I will be phone on Monday if you can get together in the next two weeks. I could really use a bit of that chocolate bar right now. I sent my daughter, Alie dark chocolate and carmel with sea salt popcorn for Valentines Day. I ran out to Whole Foods this morning to find the "Wild Sweet Orange Tea" and "Almonds with Sea Salt in Dark Chocolate". Wanted to tell you that I found them, and I came home with only the Tea... need to go to a large store for the Dark and I intend to! They will both make a wonderful mid-day treat! Your lucky friends will be so impressed by the lovely packaging and gifts. I'm with Patrick... shortbread cookies are yummy! You're so thoughtful to your friends!! This is a Valentine's package I would be thrilled to receive - what a great friend you are! I'm definently going to try your shortbread recipe! Love the gingham too! These are the sweetest packages! And I think I'll pick up some of the tea this afternoon. I would love a peek into your storage of supplies that you always seem to have on hand. You have such beautiful things to draw from. Thanks! I can't wait to try the cookie recipe!